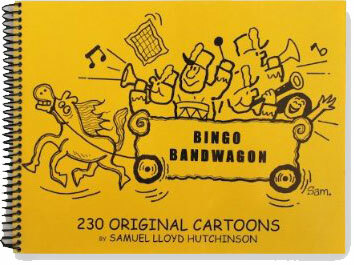 Bingo Bandwagon - Sam Lloyd Hutchinson, Sam Lloyd, Samuel Lloyd Hutchinson, famous cartoonist, author of Bingo Bandwagon, creator of Parky the Kangaroo, and many other wonderful cartoons! Can you believe that before a cartoonist friend asked me to help him out and take over his Bingo cartoon work, I didn't know anything about the game? I do now!! Before drawing my first Bingo cartoon, I did lots of research...I learned about daubers, Bingo cards, cages, Bingo balls, tickets and about the fun and intensity of the game. Creating these cartoons turned out to be something I really enjoyed and had fun with — and Bingo fans told me how much they enjoyed my cartoons...."Awesome! Wonderful and wacky!" one guy told me..."Very funny, with great drawings!" said another. Finally, thanks to the encouragement of my daughter Stephanie, we put the best of the best bingo cartoons into a book called BINGO BANDWAGON — I hope you enjoy it!! Here's a little sample of the cartoons inside... There are LOTS more!! Enjoy!! 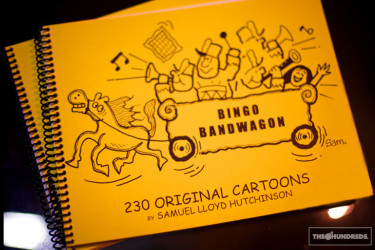 Enjoy Sam Lloyd Hutchinson's Bingo cartoons year-round with this "best-of-the-best" collection of 230 of his original bingo cartoons. Published by BingBangBoom Publishing, bingo enthusiasts and fans will laugh out loud at Sam Lloyd's quick wit and funny drawings. Enjoy!